This age-old practice of mentoring thrives in the new workplace. The benefits are still evident today. As the nation’s pool of skilled workers continues to shrink, it is becoming increasingly difficult for employers to hire “perfect” candidates for specific jobs. To survive in the competitive labor market, employers must create and offer programs that will give them an edge. The importance of an effective mentor-protégé program in today’s corporate culture cannot be emphasized strongly enough. An emerging trend is employers hiring people who come close to meeting position requirements and then training them for specific requirements. Companies are beginning to refocus their attention on the age-old art of mentoring as an inexpensive, yet effective, way to match knowledgeable people with those having less experience to promote professional and personal development. As the business environment has changed, so too has the practice of mentoring. To accommodate today’s rapidly changing organizations, mentoring situations have evolved to fit specific business environments ranging from formal/informal relationships to one-on-one/group settings to onsite/long-distance programs. The first step in becoming a mentor or protégé should be to investigate firm-sponsored mentoring programs. Some organizations formally match mentors and protégés in a structured program. In other cases, a manager might volunteer to mentor a promising young recruit, or an inexperienced employee might approach a veteran worker to ask for guidance. Many professional organizations also offer mentoring programs. All employees should be encouraged to participate in mentoring programs, either as a mentor or as a protégé. Mentors and protégés may come from different technical fields, different services, or different regions. Effective mentoring can even take place without face-to-face contact, through the miracle of technology. To be effective, the mentoring relationship should involve a minimum of two hours of dedicated mentor-protégé contact time per month. This time is voluntary. Protégés and mentors should be able to opt out of the program—typically lasting six months to a year—but they may continue the relationship if they both desire. Mentors should be trusted and experienced advisors who have an interest in the development of younger or less experienced individuals. They make a commitment to help an assigned protégé become a productive and knowledgeable member of an organization. Mentors must be committed to the process, be knowledgeable and respected members of the organization, be able to motivate and encourage others, be trustworthy, be willing to share knowledge and experience, and possess good communication skills. A protégé must make a commitment to meet with the assigned mentor regularly, usually two or three times a month. To derive the most benefit from the relationship, protégés must ask for and give feedback, take responsibility for their own career growth and success, and be open to suggestions provided by the mentor. A protégé can learn from books, as well as instructor-led and Web-based training programs. Training should also include hands-on experience. A number of methods may be employed to facilitate effective mentor-protégé relationships: project work, job rotation, shadowing, and direct instruction from experts. Successful pairings can be beneficial and rewarding for both mentor and protégé. With regular meetings, goal setting, and progress updates, both individuals gain a broader understanding and perspective of an organization and perpetuate its culture. For protégés, becoming involved in a mentoring program can lead to career enhancement, promotions, higher job satisfaction, and larger incomes. Mentors can earn the respect of colleagues and superiors. Their own work often benefits from the protégé’s fresh perspective and ideas. Companies benefit too, because existing knowledge and expertise within a company is disseminated and perpetuated—a sort of collective wisdom can be grown, nurtured, and passed along within the firm. The mentoring relationship can also be beneficial in bridging the workplace generational gap by giving employees from different age groups and mindsets the opportunity to work closely together while embracing their differences and forging new bonds. As the workplace continues to evolve, mentoring endures as a time-tested practice with proven results. No one is assigned a mentor; potential matches are identified. Both mentor and protégé enter into the relationship of their own free will with a desire to accomplish something positive. Either may opt out at any time with no repercussions. Mentoring programs are goal-based. Protégés must describe specific outcomes or goals they hope to achieve from the experience. Mentors must be outside of the reporting structure of the protégé; there can be no direct or indirect reporting relationship. No evaluation or assessment of performance may be derived from the mentoring experience—it is off the record. Mentoring may be recommended by a supervisor or requested by an individual as a developmental activity. 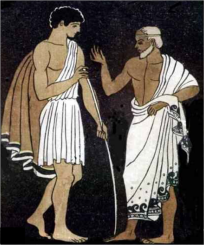 This entry was posted in Career and tagged Alexander, Aristotle, Athena, Mentoring, Odysseus. Bookmark the permalink.